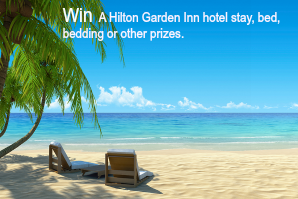 Hilton Garden Inn Store 2015 Sweepstakes – Win a 5-night stay at any Hilton Garden Inn! Win a 5 Consecutive Night stay at any Hilton Garden Inn! ENTER SWEEPSTAKES HERE – Hilton Garden Inn Sweepstakes page. ENTRY LIMIT – You may enter the Sweepstakes only one (1) time; provided, however, if you share your unique link with others as directed in the entry form, for every Sweepstakes entry submitted through your unique link, you will receive one (1) additional Sweepstakes entry. Each participant is eligible to receive up to fifty (50) Sweepstakes entries during the Promotion Period. ELIGIBILITY – Only legal residents of the United States of America who are the age of majority in entrant’s jurisdiction of residence at time of entry are eligible to enter. SWEEPSTAKES ENTRY PERIOD – The Promotion begins on October 5, 2015 and ends on December 15, 2015 at 11:59:59 p.m. ET. PRIZES – Grand Prize: Five (5) Consecutive Night Stay at any Hilton Garden Inn Approximate Retail Value of the Grand Prize (“ARV”): $650. First Prize: Hilton Garden Inn Bed Approximate Retail Value of the First Prize (“ARV”): $1,845.00. Second Prize: Hilton Garden Inn Bedding Set Approximate Retail Value of the Second Prize (“ARV”): $817.00. Third Prize: Hilton Garden Inn Duvet Cover & Comforter Set Approximate Retail Value of the Third Prize (“ARV”): $300.00. Fourth Prize: Two (2) Hilton Garden Inn Feather & Down Pillows Approximate Retail Value of the Fourth Prize (“ARV”): $178.00.